Prime Minister, the Most Hon. 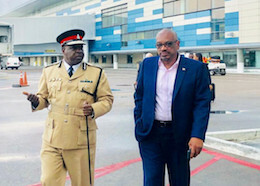 Dr. Hubert Minnis and delegation departed Nassau today for Ft. Lauderdale, to attend the Dedication Ceremony for Holland America Cruise Line MS Nieuw Statendam, Port Everglades, Fort Lauderdale, Florida. Delegation: Prime Minister; Minister of Tourism, the Hon. Dionisio DAguilar; Mr. Joshua Sears; Mrs. Viana Gardiner, Mrs. Erica Cox; and Sgt. Kirk Bastian.